In order to properly maintain a swimming pool, there are several tasks which need to be performed, most on at least a weekly basis. By understanding and completing these tasks you can have a sparkling pool all Summer long, or you can have Pooltek perform Weekly Maintenance and the only thing you’ll need to know is what suntan lotion to wear. Click the tabs below to learn more! Proper pool maintenance starts with proper water chemistry. 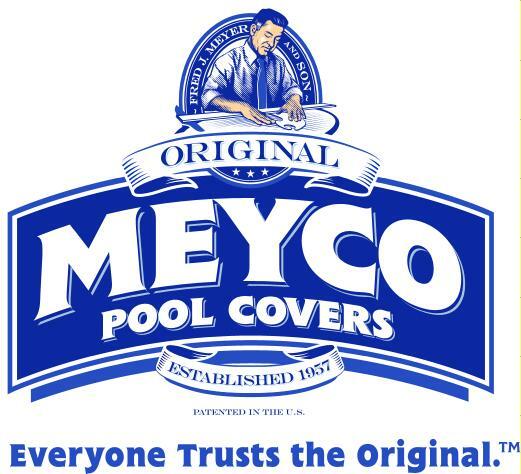 Keeping your pool water properly balanced keeps the water clear, lowers the amount of sanitizer (chlorine) you need, and protects your pool equipment and pool surface from corrosion and staining. 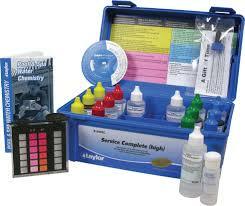 The three most important chemical levels to test are the pH, the Total Alkalinity (TA) and the Calcium Hardness (CH). pH tests how acidic or alkaline the water is. The test for pH ranges from 0 to 14, where 0 is complete acid and 14 is complete alkaline. Our tear drops are 7.4 on the pH scale, so we like to maintain the water around that level so that your eyes are not irritated when they are opened underwater. If pH is kept too high, the water can become cloudy and chlorine becomes less effective, requiring more to maintain the same levels. If pH is kept too low, the water can become corrosive and damage the pool equipment and surface. Total Alkalinity is a buffer, which helps to keep the pH from fluctuating dramatically when new variables enter the pool, like swimmers and rain. Total Alkalinity is tested in Parts Per Million (PPM) and can range from 0 on up. If Total Alkalinity is kept out of range, the pH will have a tendency to fluctuate or “bounce” around, which can cause cloudy water and perhaps staining. Calcium Hardness is a test of the amount of Calcium present in the water. All household tap water has some Calcium in it, with lower CH giving you “softer” water that many people desire in their homes. In swimming pools, CH must be kept at a level that protects the plaster surface (which contains Calcium) and along with the pH, TA, and temperature of the water to maintain water clarity. If Calcium Hardness is kept too low, the water can become aggressive and take the Calcium right out of the plaster, causing pitting of the plaster. If Calcium Hardness is kept too high, the water can become cloudy, requires more chlorine to maintain the proper levels, and can release Calcium onto the plaster as scaly nodules. To make balancing your water even easier, you can enter all of your test results here, and it will determine exactly what you need to do to get things back in balance. There are many types of sanitizers available for use to maintain the clarity and safety of your pool water. 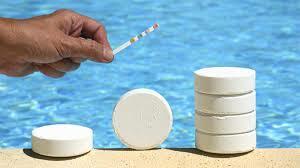 The most popular is Chlorine, predominantly added as sticks or pucks and shock powder. Other sanitizers commonly used in this area are the Caribbean Clear Copper/Silver Ionizer, Chlorine-Salt Generators, Bromine, and Ozone. For the sake of this website, we will only discuss Chlorine and our exclusive product, the Caribbean Clear Ionizer. Chlorine, and all sanitizers, main purpose in pool water is to kill bacteria to protect swimmers from infections or disease. Therefore, chlorine must always be present in the water for it to be safe to swim. Chlorine is kept in the water by adding chlorine sticks either to a feeder or in the skimmer baskets. As the sticks erode, they must be replenished, usually once a week for pools running 8-10 hours a day. Details of how many sticks to add are written on the outside of packaging and can vary for each manufacturer. The Chlorine level should be tested at least once-a-week. In addition to chlorine sticks, a chlorine-maintained pool requires the addition of Algaecide and Chlorine Shock to keep the water clear and free from algae. Chlorine Shock comes as several different chemicals, each with different dosages. Shock and Algaecide should be added weekly or if water becomes cloudy (i.e. after a pool party or several rainy days), following the manufacturer’s instructions. REMEMBER: Cloudy water may be caused by other reasons, which the addition of shock will not remedy. The Caribbean Clear Water Treatment System uses small amounts of ionized Copper & Silver together with a fractional presence of Chlorine (only 0.4 vs. usual 3.0 PPM) to fully destroy algae and bacteria. Copper is one of the most powerful algaecides. The source of these ions is a pair of Copper/Silver bars (electrodes) inserted into the plumbing at the filter. After once-a-week testing for Copper in the pool, the Caribbean Clear’s control knob may need adjustment to electronically maintain the required release of Copper & Silver. If the Copper level tests fine, you do nothing. As the electrodes wear, the knob is turned up until the electrodes require replacement, usually in about 2-3 years. In addition to the operation of the purifier, a Caribbean Clear pool must be oxidized to keep the water clear. Oxidation should be performed weekly, though sometimes less frequently, using either non-Chlorine shock or Liquid bleach. Bromine tablets may also be used in conjunction with the Caribbean Clear in lieu of a weekly oxidation. REMEMBER: Shock the pool with non-Chlorine shock or bleach ONLY. Powdered Chlorine shock could cause staining. At your equipment, you have, at a minimum, your filter and your pump. 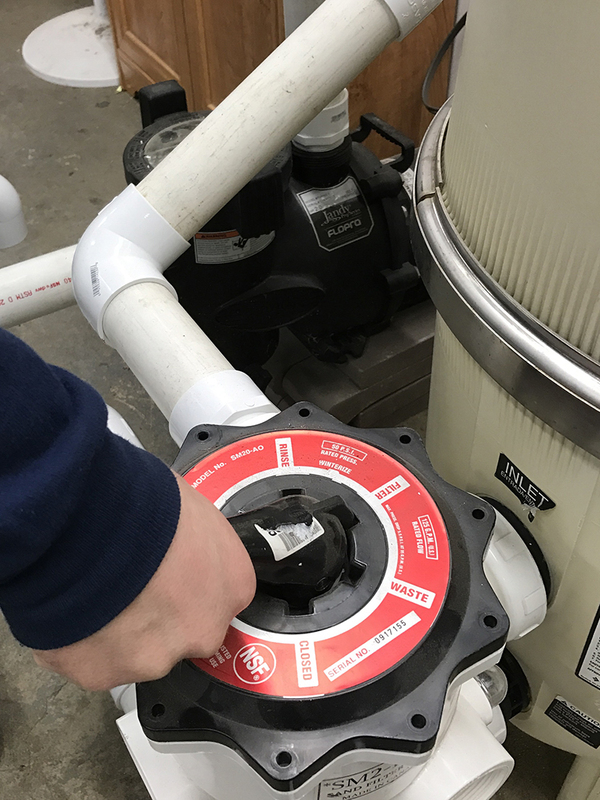 The pump is what circulates the water by pulling water in from the skimmers and main drain, through the filter and other equipment, and back out through the wall returns or other water features. The filter grabs the fine dirt as the water passes through so that only clean, filtered water returns to the pool. In order to maintain a clear pool, these pieces of equipment must be running properly and free from obstructions in the flow. Obstructions in flow start at the pool, specifically the skimmer baskets. As they get filled with leaves and debris, they obstruct the flow and minimize the amount of water that can pass through. Therefore, the baskets need to be cleaned regularly. The next step along the flow is the basket in the pump. This basket can get clogged with finer debris and similarly must be cleaned out regularly. Lastly, the filter becomes clogged over time as it pulls out the even finer debris. You will know it’s time to clean the filter when the gauge on the top of the filter has risen 10 PSI from what it was when the filter was clean. To clean the filter, you must backwash a sand or DE filter and hose off & chemically soak Cartridge filters. Turn on pump – You’re done! Obviously, to keep a pool looking its best, you will need to manually clean out dirt, leaves and debris, as well as scum that forms on the tiles and inside the skimmers. You can purchase all the materials you need at any pool supply store. At a minimum, you’ll need an extending pole, a leaf rake (net), a brush, a vacuum head, and a vacuum hose. The leaf rake is used to get the big stuff: leaves, sticks, toys, etc. The vacuum head and hose are used to vacuum up the smaller stuff and the real fine silt. To vacuum, you’ll need to sink the vacuum hose by pushing it into the water and flushing out all the air before you stick the opposite end into the skimmer. For the best vacuuming, you’ll also want to adjust the valves at your equipment, if possible, so that all suction is coming from the skimmer you’re using. Lastly, the brush is used to clean the walls and floor of the finest particles and early onset of algae. 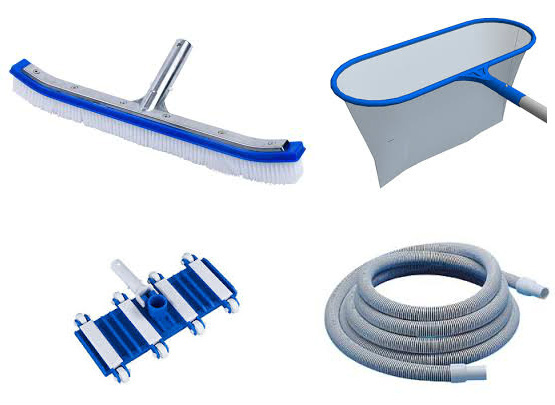 For cleaning the tiles and skimmers, a plastic scrubby pad along with a tile cleaner or algaecide can be used. Every pool is different, and every pool will develop a problem at one time or another. If you can’t seem to solve it, feel free to contact us (1-866-POOLTEK) and ask us for advice. On many occasions, we can figure things out over the phone, saving you a service call. If we can’t, we’ll get a technician out to your pool immediately to solve the problem at a reasonable price, and get you back to enjoying your backyard. And if this all seems like too much to handle, we offer regular maintenance plans to let you worry about other things.